Home Food Chandigarh is Going Organic! Chandigarh, the best-planned city of India, with a world-class architecture is the rare illustration of modernization offering an unparalleled lifestyle to its citizens. Anyone would easily fall in love with this ‘City Beautiful’ having a perfect blend of nature and development. The good news now is that the city is all set to become one of the first places in the country to go organic entirely. Are you looking for organic vegetables and fruits in the tricity? It’s time to shed away all your worries because the market committee of Chandigarh along with other agricultural institutions have come to your rescue. 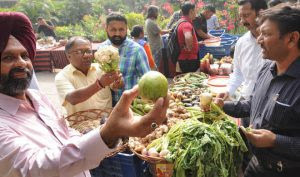 With an aim to popularize healthy eating habits, ‘organic mandis’ are being regularly organized at different avenues on different days of the week. On Tuesday and Friday of every week, you can find an organic mandi in Sector 47 and in the grain market of Sector 39 respectively. Also, one such mandi is organized in Sector 26 on Mondays. Kudrati Kisaan Haat is a permanent setup where customers can buy products on daily basis. A weekly market is mainly organized on Sunday for 2 to 3 hours in Kissan Bhawan, Sector 35 Chandigarh. In a bid to encourage a healthy lifestyle, the UT education department has assigned space for organic farming in 50 government schools. Also, the produce would be used in making mid-day meals and distributing among the students and children. This would go a long way in making ‘The City Beautiful’ an organic city. Chandigarh is all set to make India proud and set new records worldwide. It would give new standards for a healthy lifestyle and promote healthy eating habits. Chandigarh’s organic market model is growing heaps and bounds which has become an inspiration for other such initiatives which would bring about a change in the way society works.